Everything I learned about touring gardens, I learned at Montrose, a garden I visited while attending the Garden Writers Association Symposium last month in Raleigh, North Carolina. When we arrived at Montrose on our touring bus, the bus captain announced, “You need to be back on the bus in 50 minutes”, or some short amount of time like that. Less than an hour? That’s not much time to see a 61 acre garden. Even if you run, which is just not done on a garden tour, you won’t see it all. Lesson learned: Read up about the garden before you get there so you know what you want to see the most if time is limited. When we stepped off the bus, we were greeted by a volunteer tour guide who started to give us a history of the garden. She managed to keep us together as a group for all of five minutes before people started wandering off to do their own exploring. Lesson learned: If you stick with the tour guide and walk with her, at least for awhile, you will learn something about the garden to make up for your lack of research beforehand. You will also be at the front of the group, which makes it possible to take some pictures without having 60 or so other garden writers in them. Before long, garden writers seemed to be all over the garden, scurrying around like ants trying to find the best vantage point for pictures. Some had tripods and fancy camera lens and were setting up for long views of the garden. Others were focusing in on individual plants. Still others, like me, just held up our cameras and snapped pictures, hoping that when we downloaded them, there might be a few worth sharing. Lesson learned: Watch where you walk while touring a garden so you don’t wander into the path of a photographer trying to take a picture of the garden. Be patient if someone walks in front of you just as you are about to take a picture. Because we toured the garden early in the morning and it had rained the night before, the grass was still quite dewy and wet, so pretty soon my shoes were wet, too. I didn’t mind it all that much. After all, I’m a gardener so my feet have gotten wet before. Lesson learned: Think about the weather and where you are going and wear shoes that are waterproof if the occasion calls for it. If you are from out of town, pack a second pair of “garden touring shoes” to wear while the first pair are drying out. After wandering through the garden alone, as alone as you can be with 60 others touring the garden with you, it was nice to hook up again with fellow garden writers for a last look at the garden. I asked Dee from Red Dirt Ramblings to take my picture in the garden, and later Mary Ann, the Idahogardener, sent me a picture via email that she had taken of me in the garden. I liked them both. Lesson learned: I think a gardener looks happiest and most at ease in a garden so don’t be afraid to have your picture taken in the garden to remember the day. You never know when you’ll need a picture of yourself, perhaps for a newspaper article about your garden blog, or maybe for a new newspaper column. (Thanks, Christopher in NC and Mary Ann for sending me those pictures you took of me. They’ve come in handy lately!) And take a picture of your friends in the garden, too. I enjoyed the 50 or so minutes I had to tour Montrose. I got a good overview of the garden and managed to take quite a few pictures which I put into a slide show if you’d like to see them. Lesson learned: A slide show is a nice way to show a lot of picture, about one per acre in this case, rather than try to pick out a few pictures and upload them onto a blog. Back on the bus, several of us compared notes on what we had seen, and it seemed we all saw at least one plant or view that the others had not seen. To find out more about Montrose, I recommend you also read The Many Moods of Montrose by Dee at Red Dirt Ramblings. Then read about Colchicum, one particular flower found in this moment of time in this garden, profiled by Kathy from Cold Climate Gardening. Lesson Learned: Everyone sees something different when they visit a garden, through the lens and filters of their own perspective and experience. 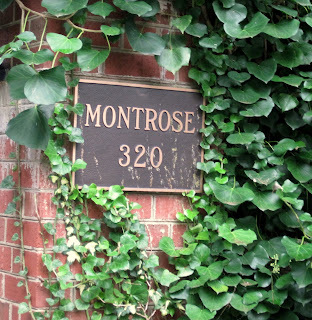 Everything I learned about touring gardens, I learned at Montrose. I enjoyed the tour and reading about the lessons you learned about touring gardens. Thanks! I only wish we had had longer there and shorter elsewhere that day - ah well, life goes on. My lesson from Montrose - take pics of pets in the garden, if you see any - everyone enjoys them. Thanks for sharing your tour of Montrose and the lessons your learned. I thoroughly enjoyed both. Lesson Learned: Everyone sees something different when they visit a garden, through the lens and filters of their own perspective and experience. That's exactly what I was thinking as I watched your slide show. I saw several things I missed and wish I hadn't. I'm going to be a much more thoughtful tourist next time around! BTW, if anyone can ID that purple blooming plant in the slide just after the colchicums, please tell me! I was quite taken with it. Oh Carol, that was lovely. All of your perceptions about Montrose were spot on. I believe it was my favorite place although every garden we saw was special. Montrose was something extra because I saw it with you. Your story reminds me of when the first Spring Fling group visited the Lady Bird Johnson Wildflower Center. Trying to keep the group together listening to the tour guide was like trying to keep the attention of a bunch of third graders on a field trip. I suppose the lesson learned for both gardeners and children is that people have a more positive experience when they can explore where they will. I enjoyed the slide show. You are right, it's better than just several pictures. Thank you Carol! The garden is special. Hi Carol, this was so wonderful to read. It put me in the moment, which is where the most joy occurs, doesn't it? It was so nice to return to Montrose and appreciate every one of those moments with you. I was clearly on a different bus than you were, but yes, my shoes were wet, too! Excellent post and wonderful ideas on garden touring. Very much enjoyed the photos in your segment. Thanks for the tour - I'm one of those people who would have really appreciated it, as I've read a lot about Montrose. Your photos certainly do it justice. Actually, I've nearly run on a garden tour before, trying to see as much as I could before I had to leave. Man, that 50-minute deadline would have distressed me with such a large garden to see. That's a nice picture of Dee and Mary Ann at the end of the slide show. Good lessons for everyone. I thoroughly enjoyed the slide show too. It was good to see you ladies again. good lessons! I can't imagine all that acreage with less than one hour to roam. Congrats on your new column! Thanks Carol, for the slide show. I loved seeing many photos of this wonderful place, but when you, Dee and MA showed up, the room brightened. We must remember to get people photos in addition to the garden shots, it really personalizes things. Less than an hour was not nearly long enough, but you managed well. I remember reading stories about Nancy and her nursery and garden. How lucky to see it and her in person. What a wonderful looking garden. Sounded like great fun too. I don't know how you managed to keep 59 other people out of all those photos! Your slide show was so much fun, as I could get a sense of the garden. Your post was most informative and cleverly done, as always.